Mr. BLOBAUM. Mr. Chairman, I am Roger Blobaum, Director of the Americans for Safe Food Project of the Center for Science in the Public Interest. CSPI is a non-profit organization with about 210,000 members nationwide. We actively support State and national policies that encourage the production and marketing of certified organic food, of locally grown food, and of food grown with minimal use of chemical inputs. We appreciate this opportunity to present our views on the Organic Certification Program. I have submitted a prepared statement for the record and will summarize in the time allowed. We support this proposal and believe it is long overdue. It will provide benefits to consumers who clearly want more organic food and at the same time want to be certain that food sold as organic has actually been organically grown. It provides standards needed to develop a national marketing system for a fledgling organic food industry that is trying to keep up with growing consumer demand. Several national surveys have shown growing consumer interest in organic food. The two latest show this trend is continuing. There was some indication last year that this might be a flash in the pan but the polls do not show that. A new Harris poll released several weeks ago showed that 30 percent of those surveyed had changed their food buying habits in response to pesticide-related concerns and 28 percent had sought out and purchased organic produce or produce grown with reduced chemical inputs. The latest consumer survey by The Packer, which as you know is the trade publication of the produce industry, found that 26 percent of the consumers surveyed reported they had changed their food buying habits because of concern about chemical residues and 11 percent said they had sought out and purchased organic food. Now, Mr. Chairman, 11 percent may not sound like very much, but if you convert that to households, it’s something in the neighborhood of 10 million households in this Country. Although high prices and shortages of high-quality organically-grown food have been cited by supermarket chains and others as serious and continuing problems, there is still evidence–you can see it in the supermarket trade press and elsewhere—of long-term food industry interest. A recent survey of 552 produce retailers, wholesalers, and processors in New Jersey, for example, showed that half the respondents, with no experience with organic food, are interested in selling it in the future. Two thirds of those inexperienced sellers cited customer requests for organic food as their most important reason for being interested. We found out how interested consumers are last summer when we made petitions supporting national organic standards available to CSPI members and others. These petitions, circulated by volunteers and returned by the and of the year, contained a surprising total of more than 136,000 signatures. CSPI has also published a directory of about 120 mail order sources of organic food. Although little has been done to promote this directory, more than 40,000 copies have been sold and the orders continue to come in every day. I think what this shows is that consumers looking for organic food will go to a great deal of trouble to find it. The national sales volume of this product is difficult to 2849 document because so much is marketed locally or sold direct to restaurants, health food stores, and other small volume buyers. The most comprehensive study that we’ve seen was completed recently by Market Data Enterprises and reported in the Wall Street Journal. It shows that organic food sales jumped 40 percent in 1989 to a level of about $1.25 billion, not too far from the figures quoted by a previous witness. Sales are expected to increase another 34 percent this year. Now regarding the proposed organic certification process and some of the comments that have been made, we are definitely unimpressed by suggestions that the kind of program proposed here would be difficult or costly to implement. Let me reinforce what’s been said about the cost. There are no new meat and poultry inspectors mandated in this bill, for example user fees should take care o much of the balance of the $60 million that the Deparment witness referred to. User fees have been an important part of all the state programs and it’s expected by the industry that they will underwrite much of the cost of this program as well. Nearly half the States now have an underlying statute that provides a legal framework for an Organic Certification Program. It is important to point out that these states. in cooperation with grower and certification organizations, are implementing programs that work well and have consumer acceptance. Virtually all the activities provided in this proposal have been amply demonstrated in programs run by State Departments of Agriculture. There is little that is new or untried in what you are being asked to approve in this legislation. should—emulate on behalf of the nation’s consumers and organic growers. The main rationale for this legislation is that State organic standards are not uniform and that this is a barrier to the movement of organic food across State lines and to the development of a national market. This legislation provides minimum Federal standards while permitting States to adopt additional guidelines. A State with stricter standards, however, would not be allowed to discriminate against production from another State. We feel that’s a workable approach. We endorse the provision allowing demonstrations of a transition label for production that meets all the organically—grown requirements except the completion of the required three—year withdrawal period. We think it would be useful to find out whether food bearing this kind of label is acceptable to consumers—no one really knows—and whether it will command a higher price and provide a financial incentive to farmers making the transition to organic methods. We also would like to see the Peer Review Panel Provision strengthened. Since the integrity of the organic label is so dependent on the professional ability and quality of certifying agents, we believe the Secretary should be required to establish peer review panels to evaluate all applicants seeking accreditation. 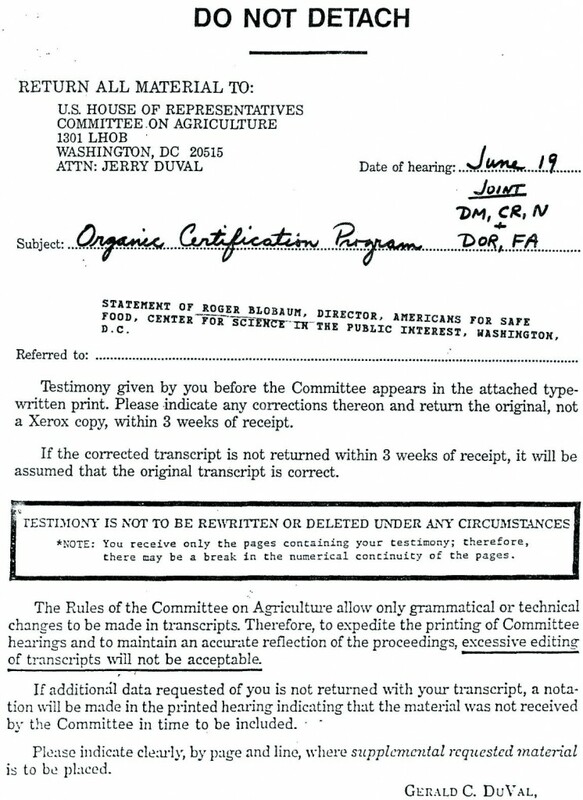 And finally, Mr. Chairman, the program proposed here will encourage environmental stewardship, provide market incentives to encourage the adoption of organic and low input farming methods, and facilitate interstate commerce in fresh and processed organically grown food. It responds to well—documented food industry and consumer demand. We believe it is an idea whose time has come and we urge you to approve it.